Bold winged messengers of daring Art! That science crown'd you safely seek your home! 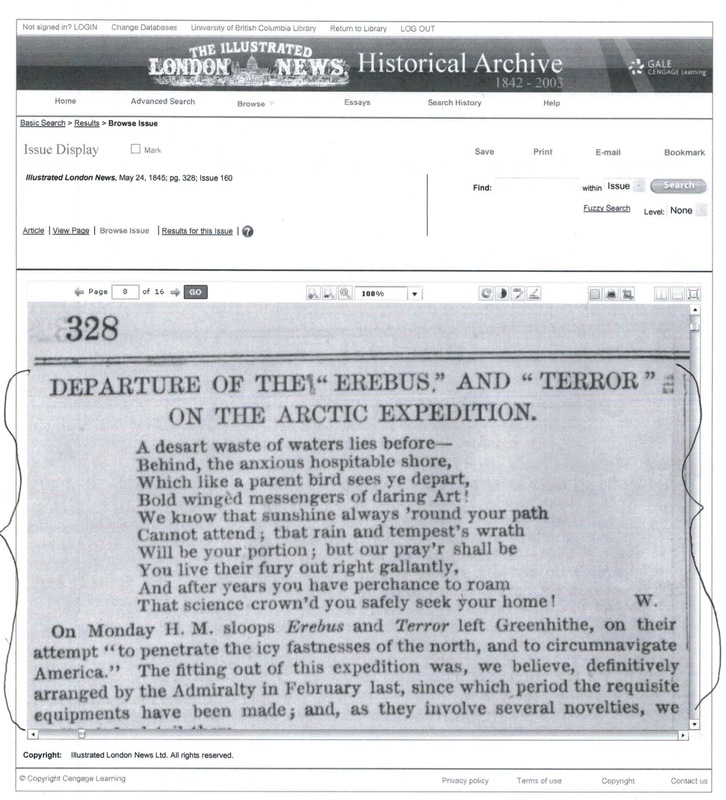 On Monday H.M. sloops Erebus and Terror left Greenhithe, on their attempt "to penetrate the icy fastness of the north, and to circumnavigate America." The fitting out of this expedition was, we believe, definitively arranged by the Admiralty in February last, since which period the requisite equipments have been made ; and, as they involve several novelties, we shall briefly detail them. [George Back's 1836-37 voyage] was the fify-seventh Arctic Expedition from England, commencing with Cabot's voyage (temp. Henry VII.) – the first of the kind that was made from our country ; and the Expedition which has just sailed is the fifty-eight enterprise of its class. The vessels were put in commission at Woolwich on Tuesday, March 4. The Expedition is under the command of Captain Sir John Franklin, Knight, K.C.H., who is appointed to the Erebus (the larger vessel), with Commander James Fitzjames, Lieutenant Henry T.D Le Vesconte ; mate, Charles F. Des Voeux ; second master, H.F. Collins ; clerk, G.F. Pinhorn ; gunner, J. G. Robinson ; boatswain, J.G. Terry ; carpenter, W. Weekes. Captain F.R.M. Crozier commands the Terror, with Lieutenant Edward Little, Lieutenant G.H. Hodgson ; carpenter, Thomas Honey. The fitting out of the vessels has been superintended and minutely inspected by the Lords of the Admiralty, and other persons distinguished in Polar expeditions. The ships are provided with the most approved Archimedean screw propellers ; and in one of the trials in the Thames, the Terror made such excellent progress that she cast off her towing steamer, and proceeded down the river without any additional assistance whatever. In their visit to Woolwich, the Lords of the Admiralty proceeded to the west-end of the dock yard, opposite the wharf-wall of which was stationed the Rattler steam-vessel, fitted with a screw propeller. Their Lordships witnessed the manner in which the screw was shipped and unshipped by tackle and chains suspended over the starboard side of the vessel, and then proceeded on board the Erebus to witness the manner in which the screw-propeller could be taken on deck and replaced in its proper position, by letting it down through a well formed in the stern of the vessel. The advantages of this mode of attaching and detaching the screw, are self-evident, and the principle is so simple and easy of accomplishment, that any vessel in her Majesty's navy may by its aid be fitted with a screw-propeller, all objection and difficulty of shipping and unshipping it on the outside being completely obviated. Their Lordships went below and witnessed the construction of the tubular boiler and steam forming apparatus, which occupies but a very small space in the vessel, and by the aid of a large pipe, about one foot in diameter, conveys hot water under the deck to warm the men's berths, and all parts of the vessel. The funnel of the furnace is near the side of the vessel under the rigging, and is only about nine feet high. The pipe for blowing off the steam is not three feet high above deck, and is near the centre and over the boiler. Several other ingenious contrivances have been adopted to render the whole as simple and perfect as possible. The decks of the Erebus and Terror are constructed on the diagonal principle, and about twenty feet on each side of the bows of the vessels have been cased with strong sheet iron. There is not any copper sheathing on either of the vessels, as no danger is to be apprehended from the attacks of shell-fish or barnacles, the ice soon clearing them from incumbrances of that description. The arrangements made for the comfort of the officers and crews are excellent. The quantity of stores taken on board is considerable, and consists of preserved provisions of various kinds, a large quantity of tea, and extra strong West Indian rum, 35 per cent. over proof. The consumption is thus provided for a prolonged expedition. Ten fine live oxen have also been shipped at the Woolwich Dockyard, on board the Barretto, Jun., hired transport ship ; she will accompany the discovery vessels to the edge of the ice, and these animals may then be killed, and their flesh preserved fresh for any length of time. Each ship has been supplied with 200 tin cylinders for the purpose of holding papers which are to be thrown over board, with the statement of the longitude and other particulars worthy of record, written in six different languages, and the parties finding them are requested to forward information to the Admiralty. The compasses of the vessels have been adjusted by Captain Johnson, and the most perfect arrangements made for the peculiar service in which the vessels of the Arctic expedition are to be engaged. Among the external peculiarities of construction may be mentioned the following :- Round the outside of both vessels is a projection as far as the shrouds, inclosing the chains as a protection against the ice : it is flat on the surface, except at the bows, which form an angle. What is generally the figure head is a solid block of wood ; the vessel is double, and the bows are a mass of timber about eight feet thick. The stern is nearly perpendicular, for unshipping the rudder ; and an ice board is raised above the bulwarks, which projects over the side, to aid in steering clear of ice. The screw propeller is worked by an engine of 25 horse power, which formerly ran upon the Greenwich Railway.